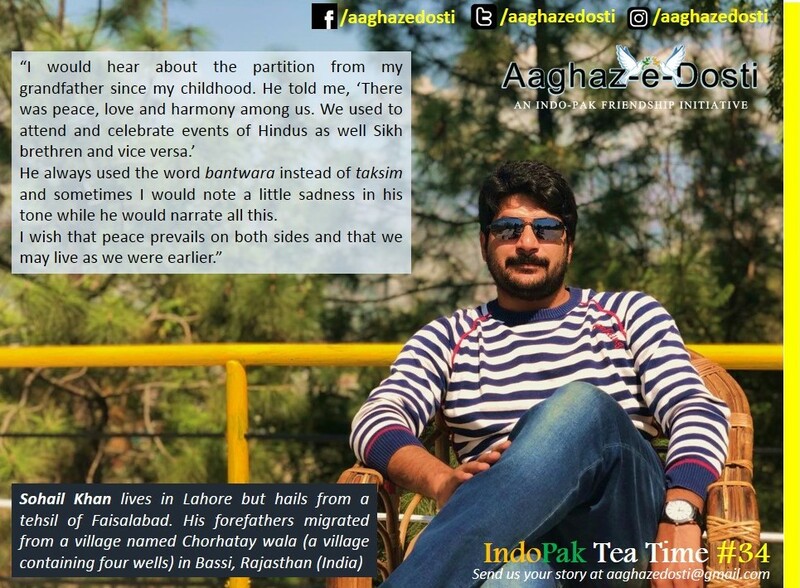 We are utilizing the virtual space through our virtual initiatives like “Did you Know” in which we post interesting and informative Indo-Pak facts, Indo-Pak Quiz and our “Indo-Pak Tea Time’ Campaign wherein we invite to disseminate stories, experiences and messages of peace from people. History, unfortunately, has given Indian and Pakistan varying reasons for hostility. It is sad to see two nations with so much in common distrust and, in general, hate each other. The media rampant with messages of anger against the ‘other’ and thus, choosing the path of friendship or normalisation is a mission of passion. 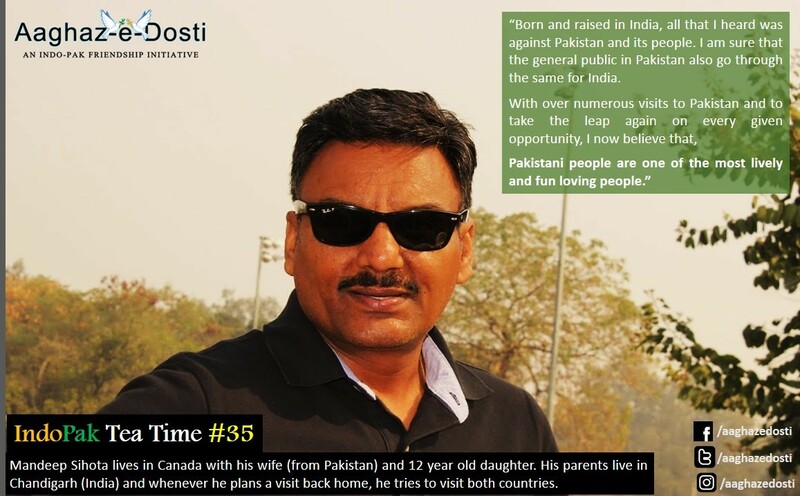 Travelling from Islamabad to New Delhi, however, has changed my perspective to a great extent. During a recent month-long stay in India’s capital, I found myself feeling as if I were a local, thanks to the similarities in language, culture and ethnicity. I fit in like a hand in a glove. Most of the time, I roamed the streets, markets and historic places. At times, I thought I was walking through parts of Rawalpindi, Karachi or Lahore! The way of talking, the markets and the people are just like us. The congested markets of Delhi took me straight back to Rawalpindi. In fact I met a delegation of parliamentarians last year when they came to Islamabad and they were surprised at how similar Delhi and Rawalpindi are. I didn’t get into any debates over my nationality in India; I didn’t need to pretend I was Indian. That’s because as far as the common man knew, I was Indian, I was a Delhi’ite. Contrary to misconceptions, no one chased me and no one investigated me. I asked about the price of salt, as I had heard many stories in my childhood of how an Indian spy unknowingly exposed himself in Pakistan when he demanded five rupees worth of salt for a glass of lassi at a restaurant. Lo and behold, there was no difference in the prices! Whenever I did identify myself as a Pakistani, all I was given was respect, love and affection. A lot of people didn’t believe that Pakistanis talk just like them and even dress like them. They were so surprised at our similarities. While talking to his family members on telephone, an Indian shopkeeper proudly informed them that a Pakistani friend was in his store. My green passport was a source of contention though. The owners of restaurants, net cafés, money changers and franchises of cellular companies are under strict instructions by the home ministry to carefully deal with Pakistanis. The Muslim community is particularly more careful while dealing with Pakistani Muslims in New Delhi. I was under the belief that I would get an Indian phone number with ease, but due to the colour of my passport, it took a week for them to process my request. When I expressed my dismay at this, the people showed sympathy and stated that they were duty bound since my name is ‘Khan’ and not ‘Sharma’. This gave me a ray of hope. Now, the challenge is to find a middle ground for real stakeholders (the common man), who become aliens as far as the governments of the two countries are concerned. I am Vinod Rowjee from South Africa. Here is one of my most cherished photo, with the famous “Chacha”, of my visit to Lahore when I was invited to the cricket match between Pakistan and India some several years ago (2006). I enjoyed my short stay. I myself am an avid cricket player. I express the hope that the two neighborly countries India and Pakistan will forge greater bond in the spirit of reconciliation and peace for the sake of a better future. Hi dear friends, I am KM Bhai from Kanpur. 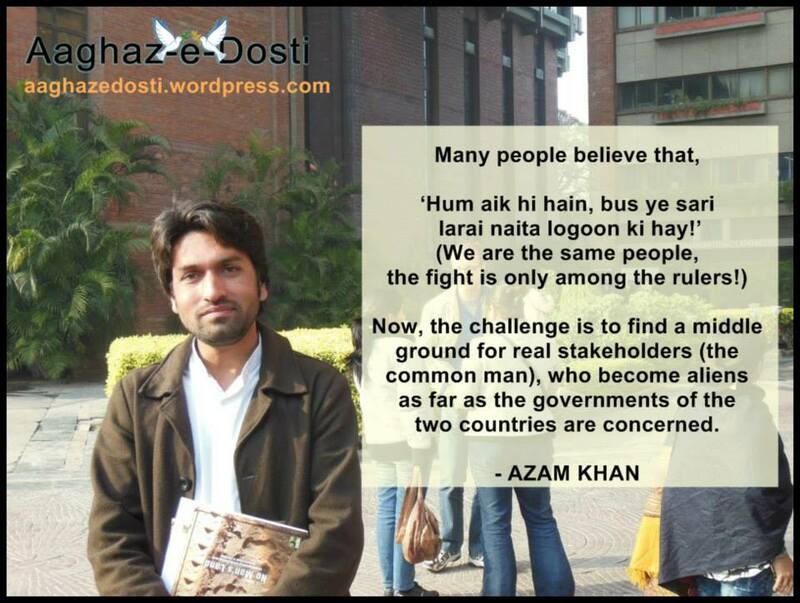 This is a piece of Poem for Indo Pak Tea Time campaign dedicated to all Indians and Pakistanis. Sare mulko me insan ek hai..
It’s quite automatic. I feel like missing that composite culture which our grandparents used to share. My grandfather told me how he used to play kabbadi with his Muslim friends. He really missed his Muslim friends..
Pta ni eh sab kuch kyu hoyea..
Kaun khich gya eh sarhadan..
And what for? Don’t know !!! Some days ago, my parents were getting prepared to go to the market. Instantaneously, my father said I’m coming back in a while and started walking to door to probably buy something from the nearby shop. My mother responded in Punjabi “Hun tuseen kithy ja rhy ho? dair ho rhi ay”(Where are you going now? 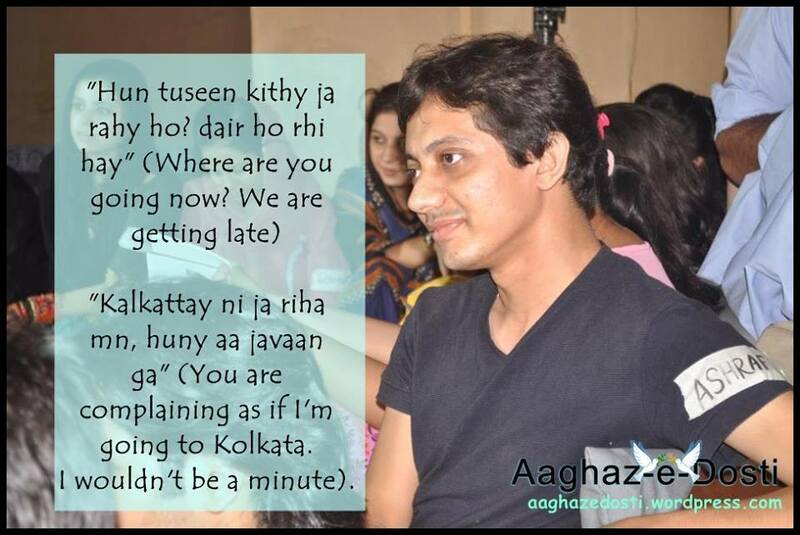 We are getting late), to which my father replied abruptly and quite ironically, “Kalkattay ni ja riha mn, huny aa javaan ga” (You are complaining as if I’m going to Kolkata. It wouldn’t be a minute). I started thinking that why did he mention Kolkata in his sentence rather than Karachi or Quetta as a unit to measure distance. For, they are equally good candidates and more importantly since 1947, for most Pakistanis visiting Kolkata has become history. The only reason I could come up with is that this impression might have been handed down to succeeding generations and traces back to the days when Kolkata was once the centre of modern Indian education, science, culture, economy and politics. So people from all over India might frequently have traveled to Kolkata to pursue better opportunities. It was back in March 2004 when I had my first interaction with anyone actually living in India. A group of Indians had come over to watch the cricket match played at the National Stadium between India and Pakistan. By chance, we ended up watching the match sitting in the same box. That one interaction started for us long lasting relationships which are very much alive even today. My first trip to India came the year after that, and was work related. And then I was able to visit India couple of times again in the next few years. Now I am constantly in touch with friends in India. 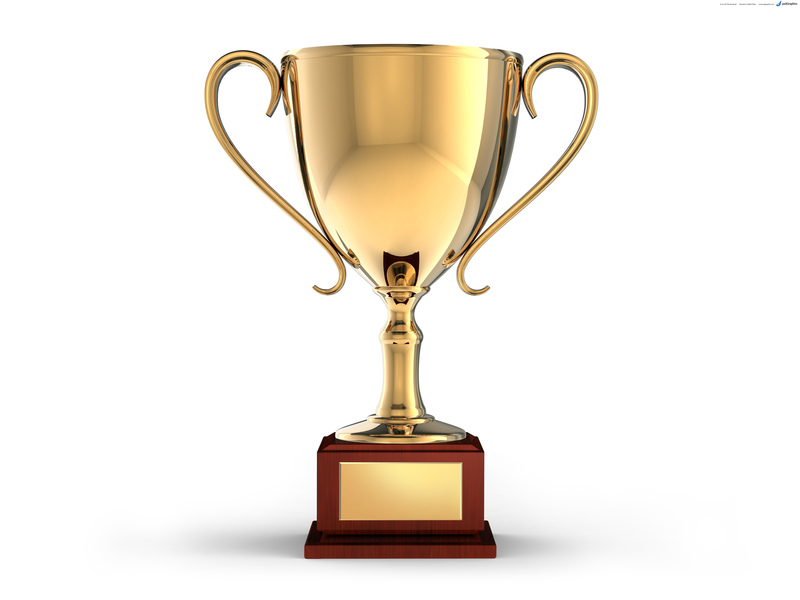 We help each other in promoting our businesses both sides of the border. All the people I have interacted with, be they my friend or random people that we met while travelling on the Rajdhani express, each one of them has been nice kind helpful, just like most people are here in Karachi. It would be great if we could travel more frequently with less hassles, as I believe we have so much in common, and both sides can learn so much from each other. I feel that Indo-Pak friendship is a good initiative to spread awareness about the invisible eternal bond that exists between both the countries. As Indians, the first country which we absorb since our early days of life is Pakistan. We do that through our mania for cricket, music, culture and news media. We start the history with Indus valley civilization which has its ruins in Pakistan. Both countries share their culture, heritage and traditions. We compare ourselves with Pakistan first and never think about the reason for this. It is because somewhere in the core of our hearts Pakistan lives and I hope that this will be the same with Pakistanis for India. With an acute observation on the word Indo-Pak, I will say the word may be written with a hyphen in between but when spoken its IndoPak and not Indo hyphen Pak. We need to change our perspective for a healthy and eternal growth of our friendship. When I was a child my grandmother narrated many oral stories of princes belonging to Dehli and Kabul, and I always heard them very carefully with excitement. I think she was a great painter of words, suspense and at the end peace and love were the main crux of her story. So from childhood Dehli or Hindustan framed in my mind and heart a place to visit and the people are welcoming. There were many reasons of her love for India; one was that she was mureed (committed follower) of Ajmeer Sharif and the 2nd her favorite uncle remained in India after separation and didn’t come back to new country Pakistan. I firmly believe that the situation will be back as it was before the separation. As I grew up, I read some books then understood that this whole area was one and the people across the Wahgah border were living in one homeland. I know and you also know that now we are living in separate countries under different constitution, rules and laws. But it doesn’t mean to fight or to grow in hostility. In modern era nations coming closer but unfortunately we are moving backward. Instead of weapons race both the governments should focus on development of poor people, on both sides of the border as more than half of the populations lives below the poverty line. AED is brilliant stuff. Being an optimist about Indo-Pak relations, I am of the view that two separate brothers will meet very soon. For me Aaghaz e Dosti is like drop of rain but I firmly believe that “Qatra Qatra Qulzim” and these drops will be sea in near future. We will be making a new history of love, peace and humanity. 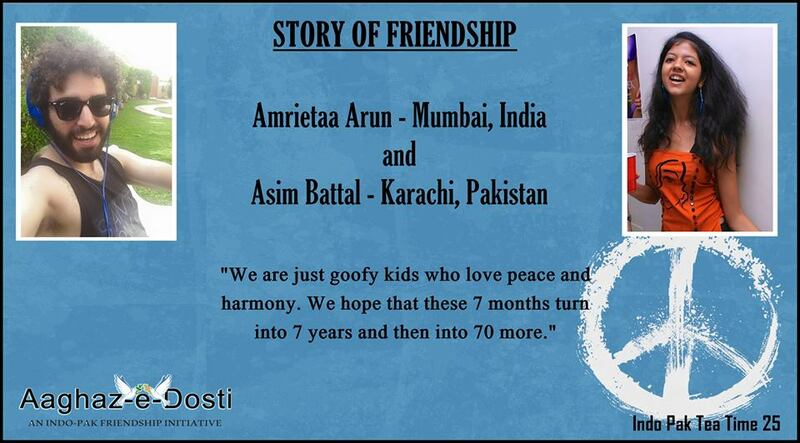 India-Pakistan: two bodies one soul, born from the same mother. I always ponder why peace is a big issue between our countries. In US, UK Indo-Pak people live as one community, as One..!! Why we fight over pity issues here. We can create that world here too. All that we have to do is trust, trust each other. It is clear from the regular attempts of both the countries that we want to make peace but the lack of trust is a hitch between the peace process of our two countries. Pakistan exists inside our souls, infact India has got its name from the river flowing in Pakistan. We share same interests for cricket, music, movies, etc. Pakistan lies within us. If we people join hands together we can make this happen, we can create a world where India and Pakistan are no longer rivals but two blissful neighbors living peacefully. 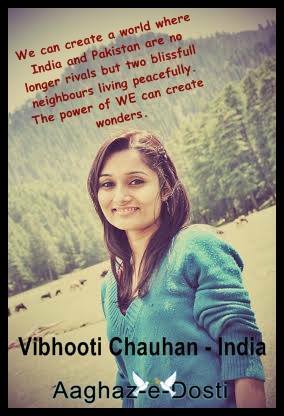 The power of WE can create wonders. Let’s be One, spread this message of peace and love everywhere. 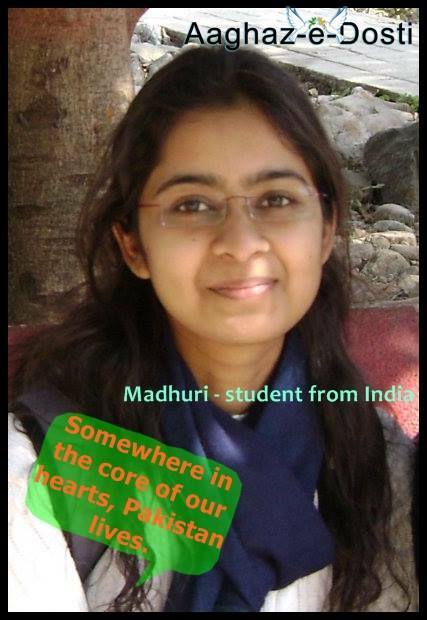 Let’s make Indo-Pak as IndoPak. As for me, my friend would toss the ball and I would merrily bat. hum jaaye kabhi us paar..
“Thought differences” should not be a reason to implant animosity but to celebrate the beauty of variation. Differences do not always imply we are good and they are bad, and similarities over surpass the small differences we have. Lets celebrate “us” and spread love. At both side of #border, though misconceptions and misunderstanding have been piled up in past but now there is time of youthful and peaceful breeze which would definitely create many possibilities of understanding and moving forward as peaceful and prosperous countries as we do have hidden love in our hearts. In my opinion peace can prevail between India and Pakistan in the current scenario by following the path of non violence, that was the path followed by Baacha khan and Gandhi jee, through which we got independence from the British. Both the countries should ease visa procedures, better they should give the visa at the borders. One suggestion is that both the countries should come to the point, to run one currency in both the countries, so that we can compete with the rest of the emerging blocks in the world. Akhair hai tu wahi insaan na? Jo iss sar zameen pe baste hai. We all know that the relationship between India & Pakistan has been complex due to a number of historical and political events. Despite that, it was always a dream to go to India, meet beautiful people and visit historical places. Dream did come true this October, despite a lot of trouble in getting the visa and long immigration process it was worth it. I will never forget the reception from the hosts, meeting amazing youth from India and other countries, a local host Harjhinder Singh Talwar’s hospitality and visiting places rich with common history. The highlight of my trip remains a day spent with an auto driver whose father was killed during partition riots while migrating from Pakistan to India. You would expect him to hate nationals of a country whose forefathers killed his father, but contrary to my fear his heart was full of love. I can still feel the sweetness of the drink he bought for me and I hope he still feels the warmth of “Jaddo Ki Japhi”, I gave him before departing. If people who have suffered the most have moved on and are ready to be good neighbors, why can’t we? Peace between India and Pakistan? Politico-mediatic gestures indicate that it’s like asking for the moon. One cannot reckon the reality of people in both the countries without a firsthand interaction. Selection for a conference in India gave me a chance to experience the !ncredible India with all my wits and senses. This memorable excursion broke many stereotypes and brought me to a verge of thinking that if compared with the rest of the world, we are very recognizably similar, equally welcoming and extremely loving. Vividly, peace and humanity is the priority on both sides of the border. I earned so much love in India that I forgot that I wasn’t in Pakistan. I already have Arpita, Zainab and Nivetha as my sisters from India, and now getting awesome friends like Vivek, Karamjit, Jaskiran, Sir Ajat and Devika; and supportive buddies like Prema, Sahil and Karun, makes me feel that India is my second home. The friendliness down the road with Nishan bhai and overwhelmed hospitality of the Dhaba owners for their Pakistani guests was also memorable. Being in the country of my ancestors was a mesmerizing experience and a dream come true. Though 9 days could not satiate my wanderlust, but what founded the lasting memories of the India Diaries was the rowdy road trip to adorable Agra’s talismanic Taj, alluring Ajmer Sharif; classy Chandigarh with pompous Punjab Kala Bhawan, sassy Sector 17, picturesque Panjab University, capacious, captivating and cordial Carmel Convent, jaunty Judicial Academy, rocking Rock Garden; dandy Delhi with idyllic India Gate, “mast” Metro, delicious Delhi 6, quaint Qutab Minar, romantic Red Fort, multifaceted markets; amazing Amritsar with gorgeous Golden Temple, haughty Haveli and omnipresent, somber stations with punctilious Police. There is still too much to see, and I hope to revisit the country to recreate the amalgam of laughter, anger, fear, pleasure, pain, joy, adventure, insomnia and all the inexplicable emotions that I lived in less than a fortnight. Coming to India to attend a conference – I was always reluctant and hesitant due to various security factors that prevail between the two countries but at the same time I wanted to break the stereotypes that persisted in my mind. I have always believed that love, affection, humanity, urge for peace are global and regardless of caste, culture, creed and ethnic backgrounds. Regardless of my fear, India was always a place that I wanted to visit primarily due to two major attractions: (1) I wanted to experience the Taj Mahal in Agra that which is one of the historic sites available in South Asia and (2) the Dargah of Ajmer Shareef that is like a dream-come-true for every Muslim around the globe, if visited. Being in India for about 9 days was wonderful experience for me. I was super excited to see the hospitality from the people, I really felt at home. Throughout this time, I collected lots of memories from fascinating beauty of historic Taj Mahal Agra to soul enthralling experience of Dargah of Khwaja Moinuddin Chisti Gareeb Nawaz (RA) Ajmer Sharif & glimpses of super green Chandigarh in form of dazzling rock garden, meritorious Carmel convent school & Judicial Academy, my visits to Great India Gate, architectural Red Fort artistic Qutub minar, passing through crowded streets of Delhi 6 and finger licking parathas & majestic Golden Temple indeed are great experience’s that I take back home. I would like to thank Nishaan veera (brother in punjabi) who drove almost two days from Amritsar to Chandigarh via Agra and Ajmer. It was a great journey with him specially those late night dhabba stopovers. Also want to thank Astinder khala, Ajaat bhai, Pramod bhai, Akanksha, Sampuran, Karamjeet (Karma as I used to call him) for their love, support and the care they provided, also special thanks to my friend Vivek who guided throughout the stay at Chandigarh and also accompanied us in our visit to Delhi. 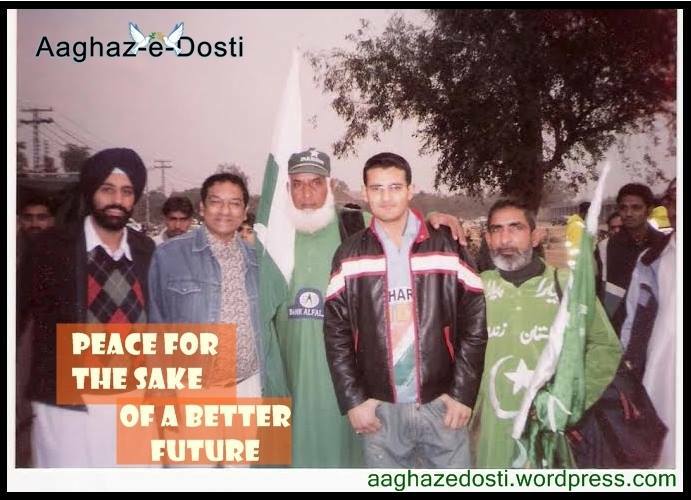 I would like to see a better picture of indopak peace in the days to come, it is an area that needs lots of focus, reduction in barriers from both sides of the border & more people to people interaction, keeping in mind the equality & mutual respect that are two most important components of constructive dialogue. 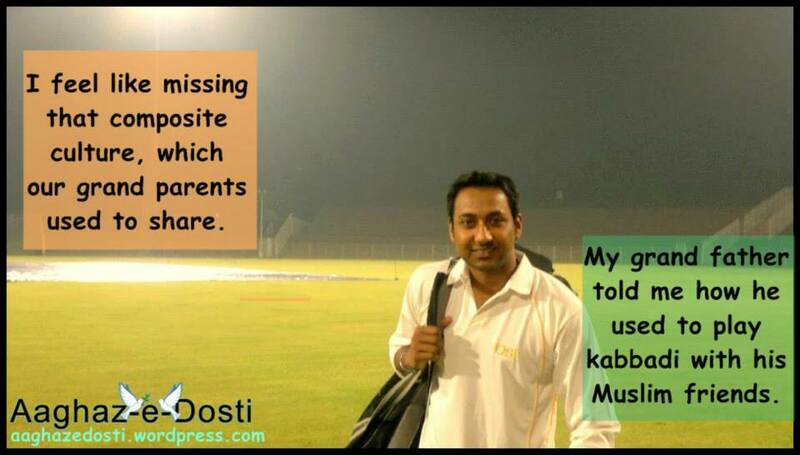 21) Ashraf Ameer from Lahore shares a thought-provoking memory/message.. 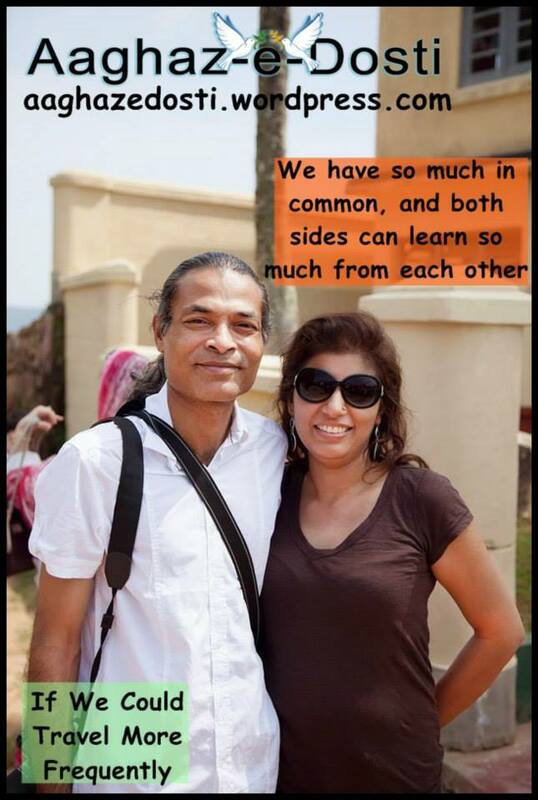 Couple of weeks ago, two of my colleagues were exchanging opinions over the riots that took place during the 1947 Indian ‪#‎partition‬. One of them was of the opinion that it were Muslims who were the ultimate victims of violence. He also justified violence committed by Muslims saying that “this was in retaliation to the train full of corpses that arrived at Lahore railway station”. i would like to learn each and every language of this world… except the language of hatred! I can read only what is written in the language of love. Earlier, English was rapidly spreading as an international language for easier communication, but these days, language of hatred is spreading globally. This is harmful for the #humanity. Let us decrease the use hate-speech for the welfare of humanity. Years ago it so happened that a nation was divided into two different parts. They eventually started parting not only by borders but by hearts also. When Indians hear about Pakistan all they think about is a green flag which represents Muslims and not Pakistanis actually. Similarly, when Pakistanis hear about India, they think of a tri-coloured flag that represents Hindus and not Indians. But we all forget that the sky is same everywhere and that humanity comes before any religion, nation or any flag. We all think about bringing a change but somewhere deep down most of us still think the same. We all want respect even when we don’t respect others. We all want love and peace when even we aren’t able to give that to anyone. What’s stopping us? Society? Religion? Borders? Nation? No. The only thing that’s stopping us is “Ourselves” We must not forget that when God made us he didn’t send us with a tag of our religion or with a passport that tells anyone which country we belong to. He has made us all equal, he made us to love each other, and not to slit innocent souls. So let’s start it all from here, if not all we can at least change our mindsets, our thinking and lend our hand in making of a new world which has only love, only peace and humanity as the only religion! Today I met an auto driver. He was a Human; neither a Hindu nor a Muslim. He was a poor guy rich in positive thoughts. I deliberately introduced myself as a Pakistani to observe the reaction. He didn’t say even a word and remained calm. I thought that he might have minded it. After driving a little, he sought my permission to smoke a “beeri” (cigarette). While Waiting on a signal, he turned around and looked in my eyes and said, “Beta, Indian and Pakistani governments wish to forge peaceful relations, but we both as part of a family (India and Pakistan) can develop peace between our countries”. Then he jumped over the tension and hatred between two countries. He said that war is not the solution of a problem; and if it would have been then today we would have been very close to each other. But, after separation, the policy makers and the politicians of both the countries taught the generation about hatred and negative history in order to deliberately create a gap between two. Then I shared my experience about living in India. Having heard my deep and emotional experience, he said that he believes that this generation of youth can definitely bring change. He smiled at me and said, “We are one, we have been one; we were separated, our family was divided on the basis of hatred.” Finally, as we had reached at the destination, he said “Apse milkr bohat khushi huye” (It was a pleasure meeting you) He smiled with a true gesture and said good bye. It was really a wonderful talk with him. He is a poor man, smokes too, but thinks positively and hopes for change, a grand change in the form of peaceful relationship between the two countries. In India, so far, I have observed that people are really positive for the question of Pakistan; they pay us great respect, they are loving, caring and treat us as their brothers. Again, some people have negative thoughts for us (Pakistanis). It doesn’t mean they hate us, but they have been told by media that we are enemies. Finally, on the both sides, people are not bad but the negative role of media is! 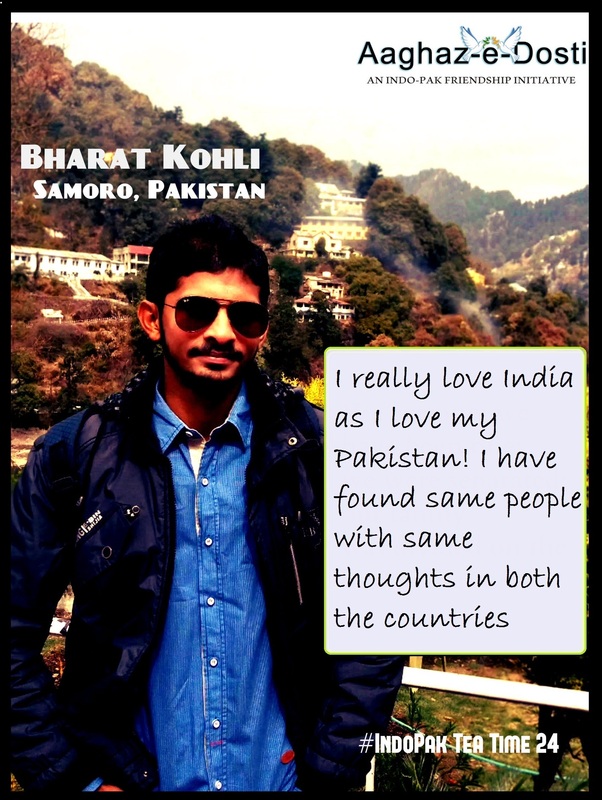 I really love India as I love my Pakistan! 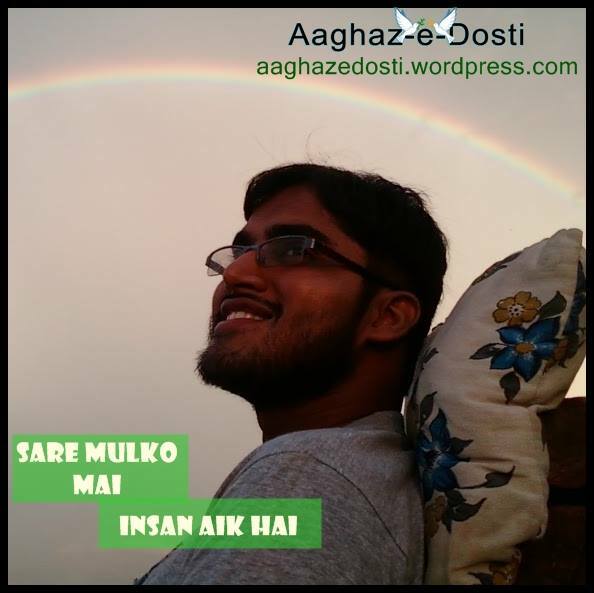 I have found same people with same thoughts on both the sides…… And today I am leaving this land for 3 months and would give a positive message to my people that India is a wonderful country..
“Inspired by the people in this group (Aaghaz-e-Dosti), I fasted for the first time in my life in the spirit of Ramzan. I want to share my experience with you all. First of all, it wasn’t that difficult at all. He always used the Hindi word bantwara instead of the urdu word taksim and sometimes I would note a little sadness in his tone while he would narrate all this. “My first visit to Pakistan was back in 2006 and since then my love for this country, it’s people has grown tremendously. I was born & raised in India all that I heard was against Pakistan and it’s people. It was ONLY negative propaganda and I am sure the general public in Pakistan went and are going through the same. This negative propaganda has been “very well tailored by the politicians to achieve their Personel gains” with the help of media. I am not here to change the thinking or a certain perceptive of people, but with over numerous visits to Pakistan & to take the leap again on every given opportunity, I will encourage everyone to take that step YOURSELF to see & feel the difference by visiting this beautiful country.